Do you have a cool new phone, but maybe you are too afraid to drop it and break the screen? We have got it covered for you! With these easy-to make DIY phone cases your gadget will not only look unique and cool, but will also be protected. This idea is for those girls who always lose their lip balms or lipsticks in their bags. Simply take your favorite lip balm in a cute package and glue it onto your phone case. Let the glue dry. Now you will always carry the balm with you. So simple and so handy! This phone case is my personal favorite! Trust me, no one among your friends owns the case like this, and it is so easy to DIY! 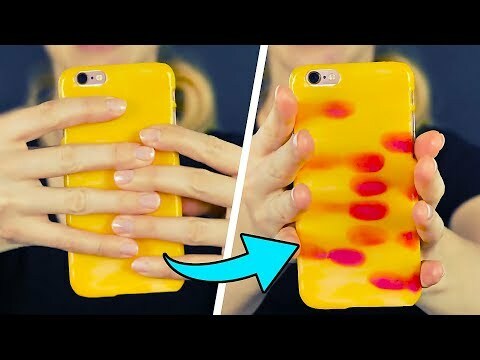 Take a plain phone case and a color-changing nail polish of your choice. Cover the case with the nail polish and let it dry. Now every time you touch the phone case, your fingers will leave bright fingerprints on it. Isn't it amazing? Do you want to look stylish this year? Then this handmade Boho style phone case is just what you need. Print a pattern you like on a simple sheet of paper, place it over your phone and wrap with some parchment paper. Now take a hot glue gun and follow the pattern with it. Don't forget about the sides and the headphones plug-in hole! Let the glue dry. Then take nail polishes and paint the phone case. Voila! Bright and colorful Boho style phone case is ready to match your today's outfit. Here come the ideas for the bravest. Take your old watch and remove its strap. Glue the strap onto the phone case. Done! Now you will never drop your phone.